blog.HalloweenAdventure.com | Latest News from the Costumes Trend FrontLines! : Why It's Grease Lightning! The other day at the gym, we caught a good 45 minutes of Michelle Phieffer in Grease 2, and we have to admit - we missed Sandy and Danny. Grease isn't Grease without Olivia Newton John and John Travolta - unless that is, you're recreating the original Sandra Dee and Danny Zuko with our favorite Grease costumes! Check out the best of the best, below. 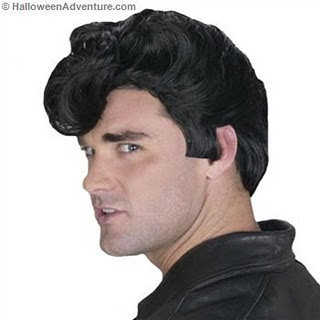 For starters, our Grease Danny Wig is a surefire hit. 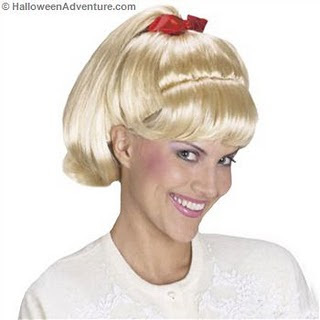 Put this wig on, and you can almost get away with wearing whatever you want. A 50s pompadour style, this headpiece might have people confusing you with John Travolta, so you might want to practice your moves. If you’re looking to go all the way, check out our Danny Deluxe T-Bird Jacket Costume. This one will have you showing off your moves in front of the neighbors. Just be careful not to injure yourself when you’re jumping on and off the car doing your dance. Danny Zuko would be proud! Going for a look that’s a bit more Kenicky? Our Greaser Wig in Black will have all the girls fawning over you in between classes. After all, everyone knows that a hickey from Kenicky is the best kind. If you’re just looking to be one of the guys, pick up a leather jacket, rock some tight jeans, and snag our 50’s Pompadour Wig. Follow Danny Zuko on his quest to captivate Sandy’s attention, and grind those hips and win those ladies with our one of a kind wig. Be sure to practice your smoldering stare in the mirror. This headpiece has a lot of attitude, and needs some great facial expressions to go with. 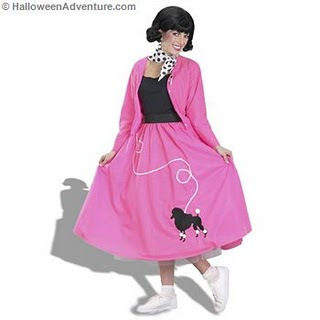 Our Poodle Skirt and Sweater Hallowen Historical 50’s Costume is ever so pink lady! Is that Rizzo you’re imitating? Or perhaps, Sandra Dee? Oh Danny Zuko, wherefore art thou? This costume includes a pink cardigan sweater and flared poodle skirt with a sequin and felt appliqué. It even comes complete with a polka dot scarf. Tie the scarf around your neck for added flair, and you’ll swear you’ve gone back in time! The great outfit above also comes in pink! This is something Frechie would be all over. Can’t you just see her prancing around the parking lot in this full pink skirt? It even comes with black cat’s eye glasses just like the ones Frenchie would wear. Go all out with added pink scarf and black cinch belt. Just don’t forget, if you try your hand at beauty school, try not to dye your hair orange! Our Poodle Outfit in Pink and Black is Patty all the way! It’s sugar and spice and everything nice, with just a dash of naughty thrown in. The black skirt has an adorable embroidered pink poodle, and we recommend tying the pink scarf around the neck just like the picture shows. Just beware, Rizzo’s never liked you, and just because you’re wearing black doesn’t mean you can win her over. To top off your fabulous fifties costumes and do Grease right, make sure and get the necessary hair accoutrements! That’s right, wigs. For Frenchie, we recommend the 50’s Housewife Auburn Wig, while Sandy can be perfectly mimicked with our Sandy Ponytail Wig. No matter which Grease Girl you choose, make sure you bring the number one best thing about Rydell High: SPIRIT!